The concept of partnership is absolutely intrinsic to Transitions Optical, Inc. The leader in photochromic lens technology has brought their product to market in partnership with every major lens manufacturer on the planet. They could have left it at that but they also saw the need to build solid partnerships with eyecare professionals and have done so in spades, providing superior educational opportunities for ECPs in the form of online initiatives, on-the-ground educational tours and the annual Transitions Academy, along with wonderful point-of-purchase materials. The public advertising campaigns undertaken by Transitions Optical have further supported partnerships with manufacturers and professionals by reaching out to educate consumers about lenses in general and photochromics in particular, in historically unprecedented ways. It’s no accident that so many consumers now know about photochromic technology and consider Transitions® lenses to be a synonym for it. 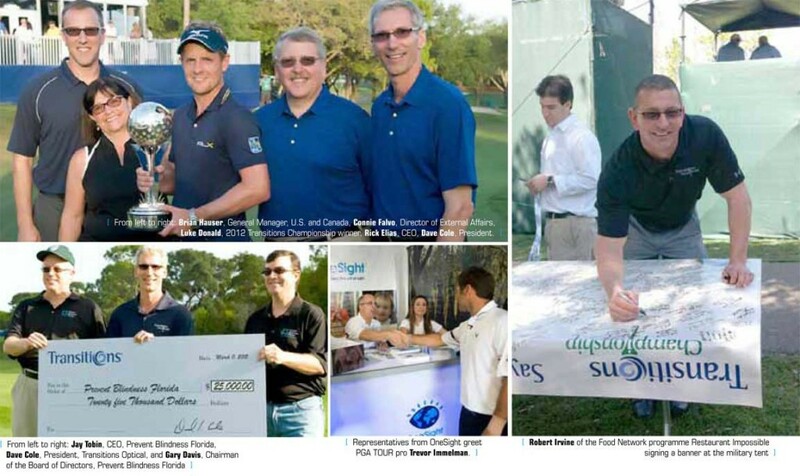 In 2008, Transitions Optical began a new partnership that has achieved incredible results for all the partners: a four-year title sponsorship of the PGA TOUR event at the Innisbrook Resort and Golf Club in Palm Harbor, Florida. The Transitions Championship® was an unbounded success from every possible point of view. Professional golf is an elite game and the PGA TOUR is affiliated with many other premium brands, including MasterCard, Rolex, Cadillac, HSBC and RBC. Choosing attractive partners who want to be associated with such a classy game certainly helps a sponsorship along! Connie Falvo, director of external affairs for Transitions Optical, spoke with Envision: seeing beyond magazine about the PGA TOUR sponsorship. The reach of media impressions for the Transitions Championship PGA TOUR event is mind-boggling. More than 800,000,000 impressions were achieved through the third year of the tournament, and over all four years of the Championship more than one billion impressions were made. Internationally, the tournament was broadcast into 500 million households in 209 countries around the globe. The number of visitors to the tournament increased every year and the 2012 event (Mar. 12-14), which marked the conclusion of the four-year agreement, attracted more than 55,000 visitors. Several Transitions-sponsored events at the tournament reinforced for consumers the connection between healthy vision and sports performance – as well as the ability to enjoy life’s everyday moments. With the support of industry partners, Transitions Optical introduced spectators to new products and eye health information, and kicked off its Official Sponsor of Sightseeing™ campaign. Over the four years of the Transitions Championship, total funds raised for charity are expected to exceed $7 million dollars! Part of the success around the activation of the partnership was in the signing of PGA TOUR professional golfers as brand ambassadors for Transitions Optical, including American golfer and 14-time winner on the PGA TOUR Kenny Perry, South African golfer and 2008 Masters Champion Trevor Immelman and Canadian golfers Graham DeLaet and Ian Leggatt. “We were able to use their names and likenesses and they did all kinds of public relations work for us,” notes Falvo. While the Transitions Optical title sponsorship agreement has concluded, the company remains an official marketing partner with the PGA TOUR and the Official Eyewear of the PGA TOUR, Champions Tour and Nationwide Tour. And because things never stand still at Transitions Optical there are also exciting new product offerings, including the first and only variable polarization lenses –Transitions® Vantage™ lenses – the only lenses that both darken and polarize upon UV exposure. Another very special sunwear product that was available at the championship – and is now on the market – is the new Nike® MAX Transitions® sunglass, designed especially for golf. These sunglasses feature a patented violet tint, engineered to enhance contour recognition on the greens and to increase visibility of the ball. ‘Partnership’ is a word that is bandied about far too carelessly in today’s business world. Let’s hear it for Transitions Optical, a company that makes the word sing in every possible way, creating win-win relationships that build business success for all.